Korzybski’s aphorism about the gap between the map and the territory tells a truth that is best understood by walking the territory. Some weeks ago my friend John and I did the Seven Bridges Walk, a 28 km affair organised annually by the NSW Cancer Council. 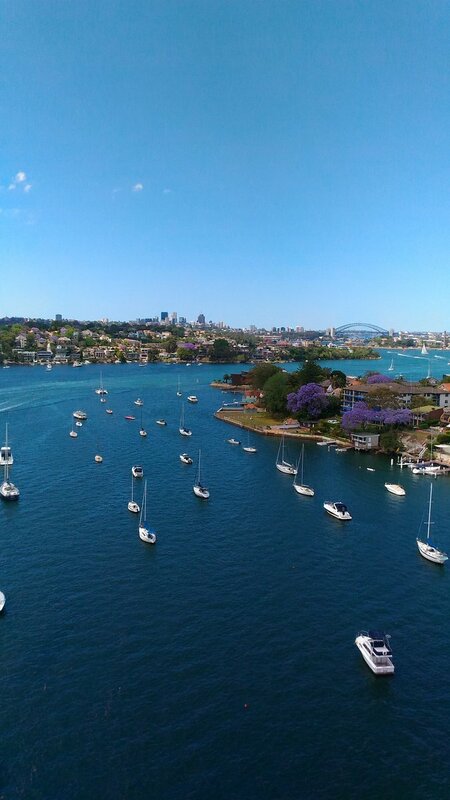 The route loops around a section of the Sydney shoreline, taking in north shore and city vistas, traversing seven bridges along the way. I’d been thinking about doing the walk for some years but couldn’t find anyone interested enough to commit a Sunday. A serendipitous conversation with John a few months ago changed that. John and I are both in reasonable shape as we are keen bushwalkers. However, the ones we do are typically in the 10 – 15 km range. Seven Bridges, being about double that, presented a higher order challenge. The best way to allay our concerns was to plan. 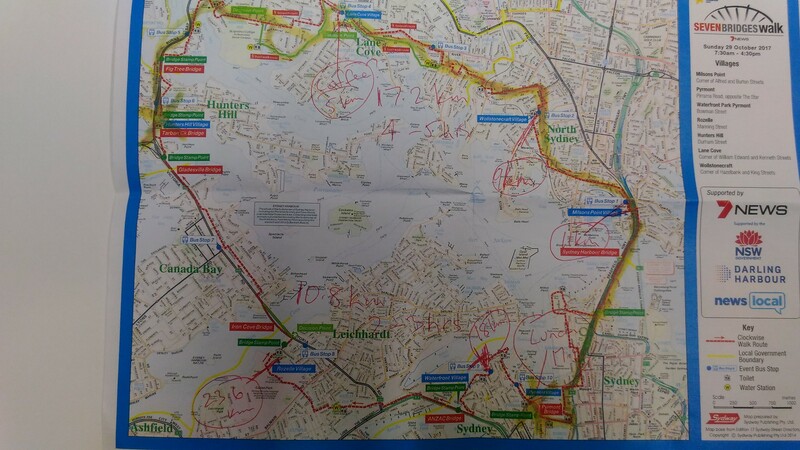 We duly got hold of a map and worked out a schedule based on an average pace of 5 km per hour (including breaks), a figure that seemed reasonable at the time (Figure 1 – click on images to see full sized versions). We planned to start around 7:45 am at Hunters Hill Village and have our first break at Lane Cove Village, around the 5 to 6 km from the starting point. Our estimated time for this section was about an hour. The plan was to take the longer, more interesting route (marked in green). This covered bushland and parks rather than roads. The detours begin at sections of the walk marked as “Decision Points” in the map, and add at a couple of kilometers to the walk, making it a round 30 km overall. If needed, we would stop at the 9 or 11 km mark (Wollstonecraft or Milson’s Point) for another break before heading on towards the city. 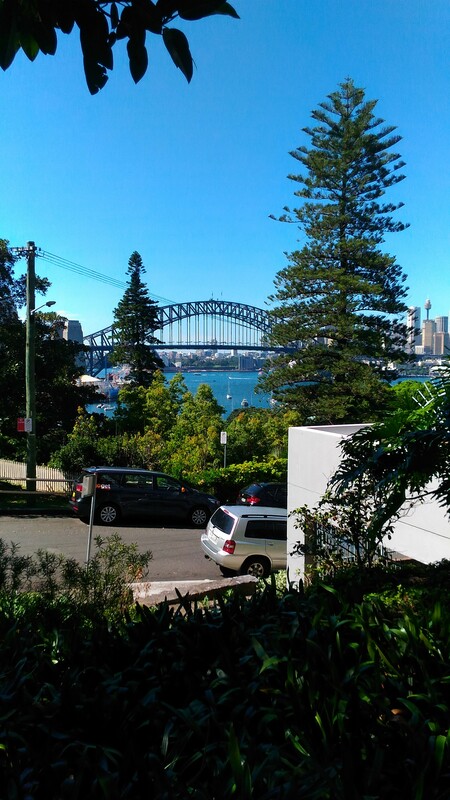 We figured it would take us 4 to 5 hours (including breaks) to do the 18 km from Hunters Hill to Pyrmont Village in the heart of the city, so lunch would be between noon and 1 pm. 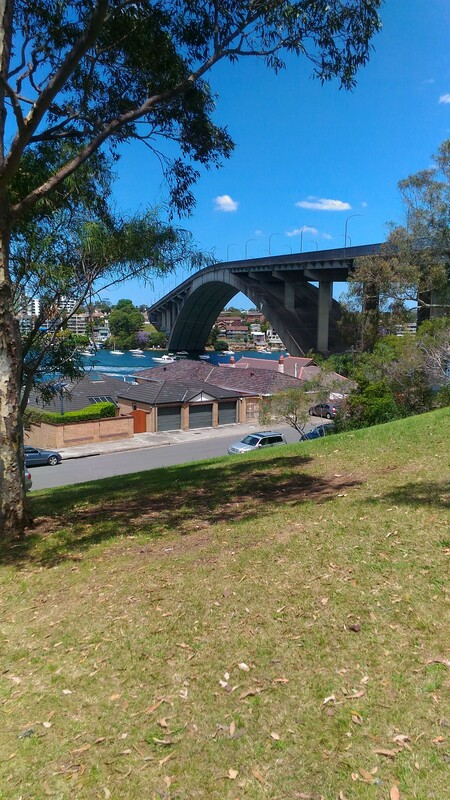 The backend of the walk, the ~ 10 km from Pyrmont to Hunters Hill, would be covered at an easier pace in the afternoon. We thought this section would take us 2.5 to 3 hours giving us a finish time of around 4 pm. A planned finish time of 4 pm meant we had enough extra time in hand if we needed it. We were very comfortable with what we’d charted out on the map. We started on time and made our first crossing at around 8am: Fig Tree Bridge, about a kilometer from the starting point. 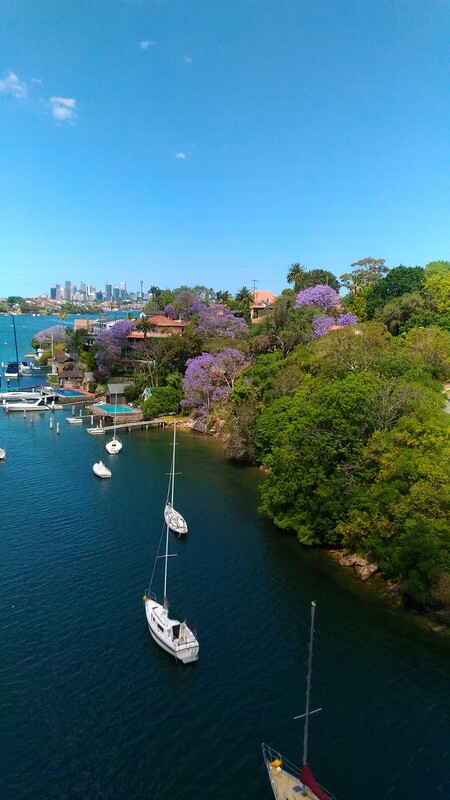 John took this beautiful shot from one end, the yellow paintwork and purple Jacaranda set against the diffuse light off the Lane Cove River. Looking city-wards from the middle of the bridge, I got this one of a couple of morning kayakers. Scenes such as these convey a sense of what it was like to experience the territory, something a map cannot do. The gap between the map and the territory is akin to the one between a plan and a project; the lived experience of a project is very different from the plan, and is also unique to each individual. Jon Whitty and Bronte van der Hoorn explore this at length in a fascinating paper that relates the experience of managing a project to the philosophy of Martin Heidegger. The route then took us through a number of steep (but mercifully short) sections in the Lane Cove and Wollstonecraft area. On researching these later, I was gratified to find that three are featured in the Top 10 Hill runs in Lane Cove. 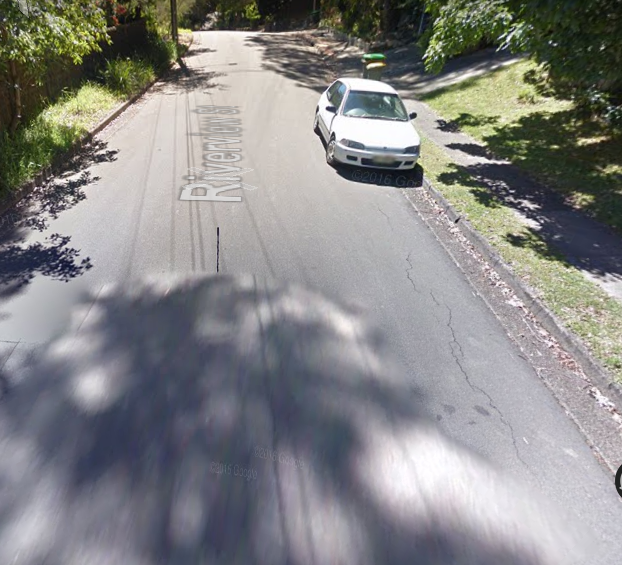 Here’s a Google Street View shot of the top ranked one. Though it doesn’t look like much, it’s not the kind of gradient you want to encounter in a long walk. As we negotiated these sections, it occurred to me that part of the fun lay in not knowing they were coming up. It’s often better not to anticipate challenges that are an unavoidable feature of the territory and deal with them as they arise. Just to be clear, I’m talking about routine challenges that are part of the territory, not those that are avoidable or have the potential to derail a project altogether. It was getting to be time for that planned first coffee break. When drawing up our plan, we had assumed that all seven starting points (marked in blue in the map in Figure 1) would have cafes. Bad assumption: the starting points were set off from the main commercial areas. In retrospect, this makes good sense: you don’t want to have thousands of walkers traipsing through a small commercial area, disturbing the peace of locals enjoying a Sunday morning coffee. Whatever the reason, the point is that a taken-for-granted assumption turned out to be wrong; we finally got our first coffee well past the 10 km mark. Figure 5: Harbour Bridge from Lavender St. The view was all the sweeter because we realised we were close to the Harbour, well ahead of schedule (it was a little after 10 am). The barbed wire and mesh fencing detract from what would be an absolutely breathtaking view. According to this report, the fence has been in place for safety reasons since 1934! And yes, as one might expect, it is a sore point with tourists who come from far and wide to see the bridge. Descriptions of things – which are but maps of a kind – often omit details that are significant. 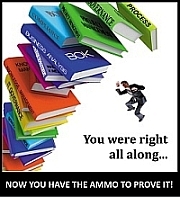 Sometimes this is done to downplay negative aspects of the object or event in question. 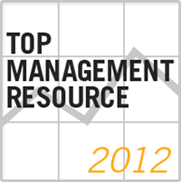 How often have you, as a project manager, “dressed-up” reports to your stakeholders? Not outright lies, but stretching the truth. I’ve done it often enough. 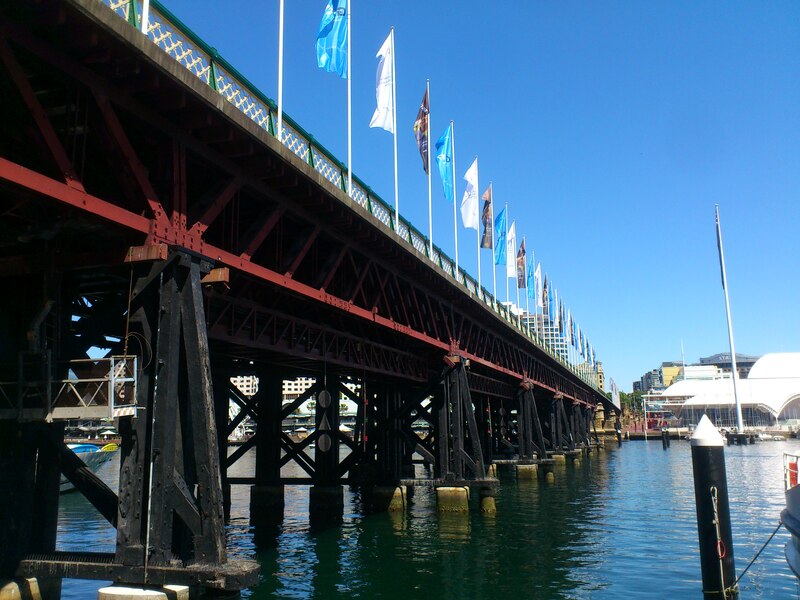 Commissioned in 1995, it replaced the Glebe Island Bridge, an electrically operated swing bridge constructed in 1903, which remained the main route from the city out to the western suburbs for over 90 years! As one might imagine, as the number of vehicles in the city increased many-fold from the 60s onwards, the old bridge became a major point of congestion. The Glebe Island Bridge, now retired, is a listed heritage site. Incidentally, this little nugget of history was related to me by John as we walked this section of the route. It’s something I would almost certainly have missed had he not been with me that day. Journeys, real and metaphoric, are often enriched by travelling companions who point out things or fill in context that would otherwise be passed over. 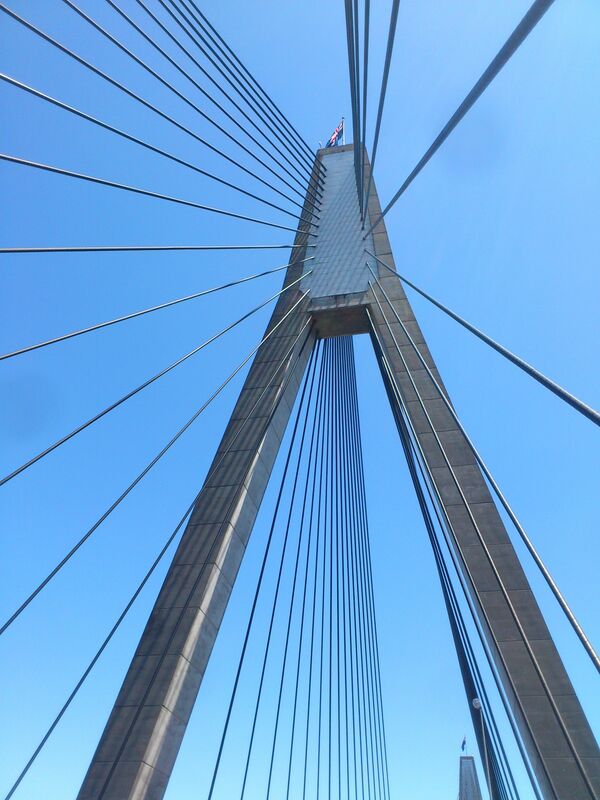 Once past Anzac Bridge, the route took us off the main thoroughfare through the side streets of Rozelle. Many of these are lined by heritage buildings. Rozelle is in the throes of change as it is going to be impacted by a major motorway project. The project reflects a wider problem in Australia: the relative neglect of public transport compared to road infrastructure. The counter-argument is that the relatively small population of the country makes the capital investments and running costs of public transport prohibitive. A wicked problem with no easy answers, but I do believe that the more sustainable option, though more expensive initially, will prove to be the better one in the long run. Wicked problems are expected in large infrastructure projects that affect thousands of stakeholders, many of whom will have diametrically opposing views. What is less well appreciated is that even much smaller projects – say IT initiatives within a large organisation – can have elements of wickedness that can trip up the unwary. This is often magnified by management decisions made on the basis of short-term expediency. From the side streets of Rozelle, the walk took us through Callan Park, which was the site of a psychiatric hospital from 1878 to 1994 (see this article for a horrifying history of asylums in Sydney). Some of the asylum buildings are now part of the Sydney College of The Arts. 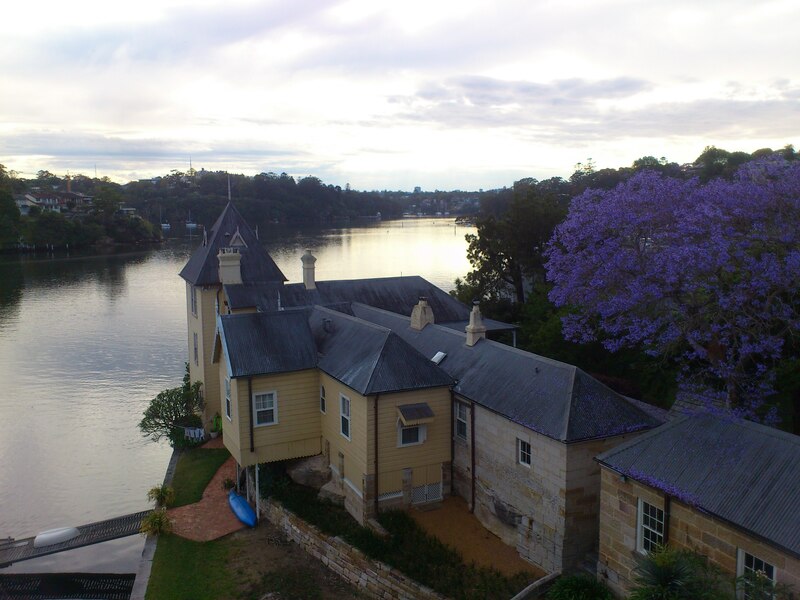 Pending the establishment of a trust to manage ongoing use of the site, the park is currently managed by the NSW Government in consultation with the local municipality. Our fifth crossing of the day was Iron Cove Bridge. The cursory shot I took while crossing it does not do justice to the view; the early afternoon sun was starting to take its toll. The route then took us about a kilometer and half through the backstreets of Drummoyne to the penultimate crossing: Gladesville Bridge whose claim to fame is that it was for many years the longest single span concrete arch bridge in the world (another historical vignette that came to me via John). It has since been superseded by the Qinglong Railway Bridge in China. By this time I was feeling quite perky, cheered perhaps by the realisation that we were almost done. 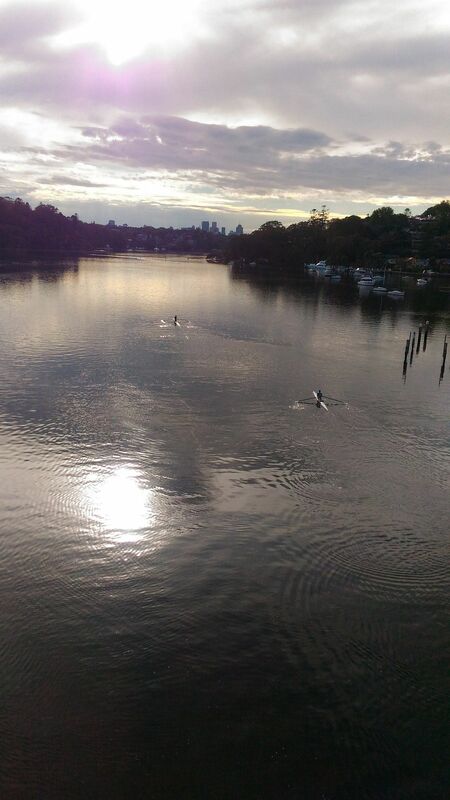 I took time to compose perhaps my best shot of the day as we crossed Gladesville Bridge. 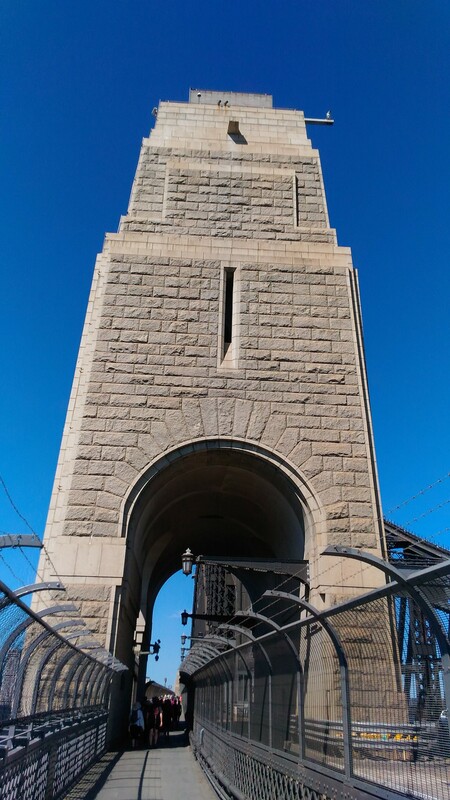 The final crossing, Tarban Creek Bridge was a short 100 metre walk from the Gladesville Bridge. We lingered mid-bridge to take a few shots as we realised the walk was coming to an end; the finish point was a few hundred metres away. 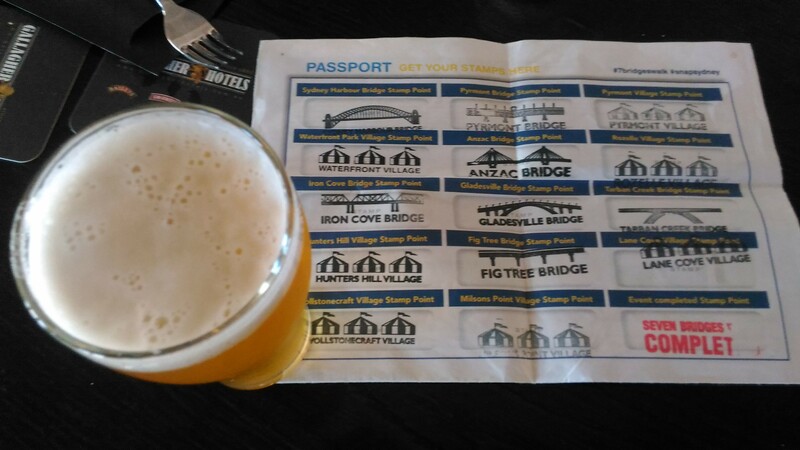 We duly collected our “Seven Bridges Completed” stamp at around 2:30 pm and headed to the local pub for a celebratory pint. Apart from being impossibly cumbersome, a complete map of a territory is impossible because a representation can never be the real thing. The territory remains forever ineffable; every encounter with it is unique and has the potential to reveal new perspectives. This is as true for a project as it is for a walk or any other experience.